BG (Res.) Jacob Nagel is currently a visiting professor at the Technion, Haifa (Aerospace Engineering Faculty). Professor Nagel is also heading the CSST (Center for Security science and Technology) and the PMRI (Peter Munk Research Institute). Nagel served as the Head of the National Security Council (NSC) and as the PM National Security Advisor (Acting) from Jan 2016 until May 2017. Before he was the Head of the startegic and defense Policy Directorate at the NSC (since May 2011). Professor Nagel served in various positions at the MOD DDR&D (Ministry of Defense – Directorate of Defense Research & Development). He was the Scientific Deputy from Aug. 2001 until April 2011, The Acting Head of the military R&D from Jan. 2002 until Feb. 2004, The Head of Planning and Budgeting Division from 1998 to 2001, and the head of the Sigint Branch from 1996 to 1998. 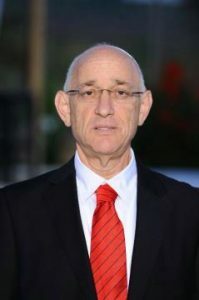 Nagel served as a technical expert at the Israel Sigint National Unit (ISNU) from May 1980 until April 1996. BG (Res.) Jacob Nagel was born in 1957, he is married and has 4 children and 5 grandchildren.